Exciting to see this develop. Mr. Right got his color and size from Drag Iron, horn from Helm Laura's Light Mocha, Drag Iron and WS Jamakizm. Slow to mature but still off to a great start. Projects to 86"+ TTT and I suspect he will do more than that. He will be a large bull. Many reasons to love this combination. Has four full sisters that are off to great starts if that is any indication. Great horn set. Still pointed back. Grew 39.5" over 54 weeks. That's 3.14" a month for a year. Measured over 60" TTT with 4.5 months until he turns 2. Projects to over 90" TTT. Hard not to get excited about his potential. His dam is just crossing 90" TTT too. Both Grand dams are known out producers! A great example of what Catchit Chex is doing with female horn sets. Linebred JS Overdrive on the bottom, which means 2x Overlyn. Lots of twist and conformation here and twist take more time and patience! Full sister to 90" TTT Pacific Yellow Bell. Produced BR Teardrop from Heaven. Owned in partnership with Blue Ridge Ranch. The dam to JBM Becca II. Longest Mile Marker daughter out there with over 87" TTT. Great twist and one of the best in her time. Mile Marker crosses with everything. Going to have horns like her Grand dam Wiregrass Laura. Twist out up high. One of the very best in the breed. Very laid back. Should easily pass 90" TTT even with her heavy, beautiful twist. Her first heifer is proof of her ability to produce, she is just under 60" at 2 years. Big framed daughter of a huge twisty horned Winchester grand daughter. Wanted to put her frame and body under Cowboy Tuff Chex to see what it could do. I like it! 100" sire x 95" dam. Hard to beat! Body to go with it. HCR's most productive line plus WS Jamakizm combined with JP Rio and Poco Lady. Watch out! Dam is just about to cross 90” TTT. Extremely flat horn set. Incredible disposition. One to watch. Tuff 100" TTT x Mocha 95" TTT. She got the best of both of her parents. Long, tall, colorful, TTT and temperament. Line bred Tejas Star. Was 57" TTT at 24 months. Could get to 90" TTT. Tejas Star over WS Jamakizm. Excited to have this genetic package to work with. Starlight, Wiregrass Laura and a 95” TTT dam. Very lateral horn set with slow grow genetics. She will be a late bloomer but when it comes it will be something special. Excited to have a pedigree loaded with Phenomenon. Such a proven producer in the many of the best pedigrees. Awesome Viagra is potent and timeless! Bringing her back to her birthplace! 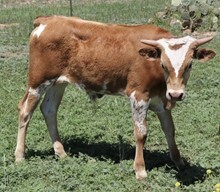 She was born at the ranch and glad to have the chance to have her genetics contributing to our future. ZD Kelly can grow some early horn, combined with slo grow WS Jamakizm just might be the ticket! Projects to over 95" TTT. Changes color through the course of the year but there is definitely some brindle in there. A full brother to Jake (Maternal Grand Sire) deep in the pedigree on the dam side. It clicked with Rio Bravo Chex! Great all around animal. Big frame and black roan coloring. She is bred to Doc Holiday, a black and white Concealed Weapon son. Hopeful this will throw a black and white calf. Plenty of horn in pedigree. Like her low set twist horn set. Black traces back to sire's side.....Overhead and Hunt Demands Respect. She will be one of the foundation females for us to build out a black and white herd. She just might be homozygous herself? We will soon find out. I have long been a fan of Kelo Chex with his BL Night Chex pedigree. Flat horn set, thick body, Top Caliber, Feisty Leigh and 50/50. Sweeeet! Her sire, 50 AMP....a Jimmie Jones bred bull involving one of his most productive cows, had another daughter that sold for $76k. She had the same flat horn set. Very docile cow. An over 80" Mile Marker daughter. Some Gunman and Starlight on the maternal side. Mile Marker offspring are like universal donors (they cross with everything) with Shadow x VJ Tommie. They throw color too. A great example of what Hubbell's 20 Gauge can do! Ruby's horn set goes on for days and the way she is set back makes me think she can get into the upper 90" TTT. She is linebred ZD Kelly over WS Jamakizm on the bottom and 20 Gauge on the top. One 90" and nine other over 80" ttt in her pedigree. 12.5% Jamakizm, 19.7% ZD Kelly, and 25% Concealed Weapon. Dalgood's has her past 96" TTT. Has her whole future ahead of her. Will combine on my uppermost end with Nova, Mocha and Jenny offspring. Bought her at the EOT dispersal and did so because I liked her mother so much. She will be an interesting cross for us. Flashy daughter out of an out producing cow, Fancy Tammy. Youngest of the four full sisters. Her dam, TTT Jammin' Jenny, sold at the Hudson Valentine Stockyards sale for a tidy sum. Glad to have this girl as a piece of the puzzle. Line bred very tight but really looking good. Love her horn set. Starting to look like her dam!!!! This genetic concentration could explode in the next generation. LLL Lucky, WS Jamakizm, Phenomenon, Starlight, RT Diamond Ramblin Rose and Awesome Rosebud.....wow. Looking like her momma, and that's a good thing! Three consecutve over 80" TTT on the maternal dam side provide a lot of fire power to Firefly Too. Throw in a little WS Jamakizm, JP Rio, Cowboy Chex and Top Caliber for good measure. One of five daughters we have from Helm Laura’s Light Mocha, 94”+TTT, from four different sires. 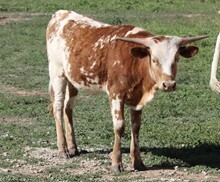 This daughter has Cowboy Chex for a sire and it shows in her conformation, base and horn growth. Off to a great start. As good as it gets! 101” x 98.5”. A nice addition to our ranch genetics. I look forward to see what we can do with this. Heavy duty twist. She is going to be something before she is done! Won’t be too many like this going forward. WS Jamakizm leads the pack with females over 90”TTT. Could this girl join the club? Worth the chance. Dam has shown she can out produce herself several times. Nothing like adding the power of Jake to a productive cow. 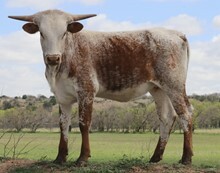 Line bred Cowboy Tuff Chex, she is 50%, the equivalent of being a Tuff daughter. Half brother bred to a half sister. Throw in Tari Graves at 6.25% and some strong older Butler bloodlines for good measure. 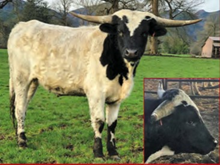 Combines the longest horned bull in the breed with the beauty, color and production of the Mazue line. Shows the strength of Farlap Chex on the maternal side of the pedigree. Really like what I am seeing from this guy. Best I can tell has 16 or 17 over 80" relatives in his pedigree. He would be a nice outcross for me. Another one to watch. Been in the plans for a loooong time! Finally have a pedigree with both Helm Laura's Light Mocha and Awesome Nova. He will have a role in my future plans. Face is starting to brindle. 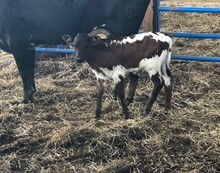 Houdini continues to impress the industry with his offspring and to have a bull that combines his patented very flat hornset and Jenny’s color, horn, size and disposition is remarkable. I look forward to seeing how he develops.